Presented to iTEN Wired in October, 2014. Complete software and web design development services. 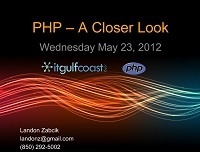 Presented to IT Gulf Coast in May, 2012. Complete, dynamic online business direcotry for Pensacola, FL.